Pullman sleeping car "Macedon" was originally used by the South Australian and Victorian Railways on The Overland before being sold to the Commonwealth Railways. One dining and two sleeping cars were jointly purchased from the Pullman company of America in 1927, at a cost of £19,378 for each vehicle. The sleeping cars were jointly owned by the South Australian Railways and Victorian Railways, and featured twin berth cabins, which had own washrooms, wall bracket lamps, wardrobes, hot and cold water, fan, chair and a shoe locker that opened to the corridor. Each berth had a personal toilet and was steam heated. Because of their weight they were withdrawn from service during the depression years (1930-1935) and altogether in 1940. The dead weight of nearly four tonnes per passenger was too great, costing 4.5 pence per Km to shift against 2.8 pence for older stock. 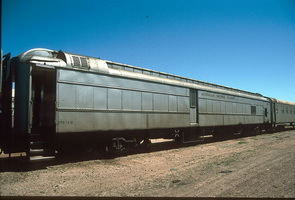 One of the sleepers was sold to the Commonwealth Railway for use on the Trans Australian Railway and described as a non air conditioned sleeping car. 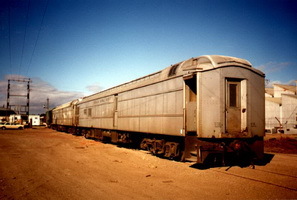 It operated intially as a first class sleeping car, but was eventually replaced by more modern rollingstock, eventually being used for some time as dormitory cars for drivers of road trucks being piggy backed across the Nullarbor. Eventually it was place into storage until converted to a "Marketing Van" for use on the "Tea and Sugar" service. See also: Mount Lofty and Adelaide. 8.6.1928 Entered service on The Overland named "Macedon". 2.1950 Sold to the Commonwealth Railways for £8,000. 21.7.1950 Entered service coded "ARC 74". Initially it was painted chocolate and cream. The originally 6 wheel Pullman bogies were converted to standard gauge. 1957 Used on the Marree mixed trains as an unbooked sleeping car after the opening of the standard gauge route to Marree. 1964 Repainted maroon and silver. 1973 Taken out of service for conversion to vehicle "VPB 74". This conversion was delayed due to funding and other priorities, resulting in the car being stored in a partially stripped state. 29.10.1979 Reentered the roster under its new identity on Commonwealth type 4 wheel bogies. "VPB 74" was described as a marketing van for Ausrail retailers, in other words, a mobile shop on the Tea and Sugar train. 1997 Withdrawn from service due to termination of the Tea and Sugar train. 8.11.1997 To Australian Southern Railway. 6.1999 Had been transferred to Parkeston. It was destined to be grounded and used as a delivery base for stores. The bogies were already earmarked for another project. - Interior badly damaged by fire. 2004 Sold to a private victorian consortium [cp 1.2005]. by 3.2012 External restoration complete, interior parially complete. [rpf].